Try out new ways of prayingRead and interactServe others in creative waysThe big difference is that a TiE group is a group of three and no more. Some groups could implement TiE principles into their own group meetings. Some groups might want to create mini-groups of three within their LIFEgroup. Some might just use the principle to launch their own TiE group. You can read more about TiE at their website here. See the biblical rationale for this method of discipleship here. thanks to Kim Martinez for the heads up on TiE. Click below for this week's LIFEgroup Weekly. This edition includes help for dealing with conflict in your group as well as discussion questions based on this week's HUMILITY sermon. Here's an interesting list you can share with your LIFEgroup to help them prepare for Sunday morning's Celebration Gathering! 10. Do I have my Bible? 7. Does my family have their Bibles with them? 6. Have we prayed before leaving the house? 5. Have I considered the lesson and Bible class from last week? 4. Who did I not talk to last week who I will this week? 3. Have I prepared my soul for worship this morning? 2. Are my children ready to sing on the way to the building? 1. Will my attitude while driving to services reflect the love of Christ we will talk about in service? Sometimes people don’t get along. Sometimes disagreements between people can tear a group apart if not handled well. That is not to say conflict should be avoided. One of the greatest "killers" of positive group life is an avoidance of conflict. While conflict should never be fun, it is a necessary aspect of living in a fallen world. We are different people with differing ideologies (because we don't always grab on to the "mind of Christ"), and so we must learn to communicate about those differences in healthy ways. Patrick Lencioni’s book Five Dysfunctions of a Team has an excellent chapter on how to engage in healthy conflict. Below are some of his ideas, altered a bit to fit the small group context. Here is Part Two in my series on dealing with "Community Killers". Today the topic is "Crisis". Openness. The first step in a group’s efforts to deal with crisis is simply knowing about and understanding the crisis. If a member does not feel comfortable sharing the crisis issues in their life, the group cannot come to their aid. A willingness to share not only the crisis situation, but also the details can significantly impact the degree to which the group can offer assistance. on, themselves or God? Why was this a problem? John Calvin thought that verse 6 was God ironically saying, “Thispeople have conspired against me, and since they can speak toone another in the same language, how can their plan be defeated?”In other words, God wasn’t concerned, he found it humorousthat the people thought so highly of themselves. wanted to “make a name” for themselves? judge ourselves in a healthy way? 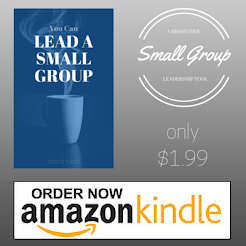 Here's a great post about small group leadership from Carter Moss. We have a saying around here that we use when referring to the really important parts of a conversation with someone that can be tempting to leave off--we call it "the last 10%." It's that last 10% of things that you really needed to leave someone with, that maybe you stopped short of doing.